Environmental risk managers at banks understand why due diligence is important to protect the bank from collateral devaluation and liability exposure, but how well do they communicate this value up the chain? Environmental due diligence is important, along with evaluating a borrower’s creditworthiness and getting an appraisal done, but only in the broader context of originating loans. The difficulty in bridging the gap between environmental risk managers and loan officers/senior management was identified as one of the key challenges faced by risk management professionals, particularly at community banks. 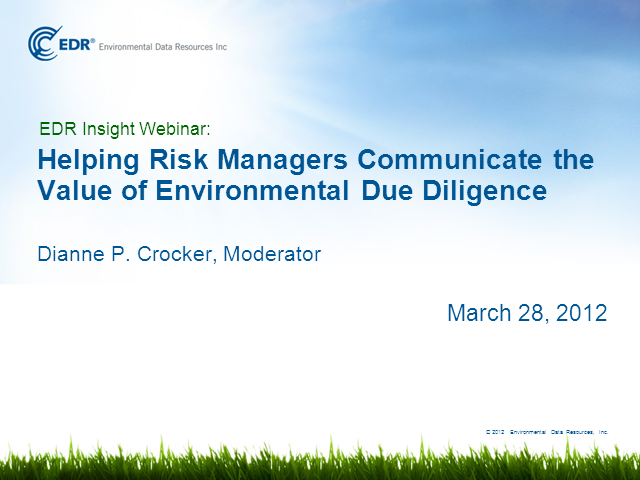 This webinar will provide lenders with actionable intell to help them educate senior management and loan officers to foster a greater understanding across the bank of the importance in understanding environmental risk and the liability the bank can face if environmental due diligence is not properly addressed. Join us for this webinar as seasoned insiders selected from the ranks of a large bank, a regional bank and a community bank share their experiences in communicating the value of environmental due diligence internally at their institutions. In response to the Small Business Administration's recent updated guidelines for a Record Search with Risk Assessment (RSRA), EDR is excited to announce the release of LoanCheck® RSRA, a powerful desktop screening tool that is not only SBA-compliant, but leverages the best available data, geocoding technology, and review tools. Join our Product Spotlight webcast where we’ll unveil this new, advanced RSRA report. With SBA’s new environmental guidelines that went into effect January 1, 2018, you’ll want to be sure you understand the new requirements, and the solutions available to help comply. EDR’s James Haberlen and Cathy Reed will provide an overview of this exciting new SBA report. They’ll discuss the latest advancements in geocoding technology to enhance mapping accuracy, the data that makes up an RSRA, and the market-leading Lightbox® data viewer that enhance the quality and speed of the opinion provider’s review. Who should attend: Any Lender or Community Development Company originating Small Business Administration 7a or 504 loans. This expert panel will take a candid look at the importance of robust risk management at this stage of the market cycle. Looking back, there have been important milestones in the evolution of risk management from the early days of “Phase I or no Phase I?” decisions based solely on loan size. Other areas—like the alignment of the appraisal function and environmental risk management function—are still evolving. As the market enters a phases of moderating property values, lenders should be turning a close eye on their risk management practices. The impact an environmental issue may have on a property’s value is more significant as prices decline. Risk managers who are being challenged to make a case for tighter underwriting will learn valuable ammo for explaining why ERM is more important than ever. Attendees will also learn more about the future direction of regulatory guidance to better reflect budding industry best practices. Michael Kulka, Founder and CEO, PM Environmental, Inc.
Join us as KC Conway, a noted expert in CRE lending, takes us on a “no-squiggly-lines” presentation of the forces disrupting commercial real estate lending. Attendees will get a look at today’s top disruptors, changes in high-growth MSAs and the key market trends that are reshaping the risks of lending on different asset classes. Conway will also look past the headlines about double-digit growth in CRE originations to stratify lending trends for major sources and explore what is restricting growth in some sectors of the market. K.C. Conway, MAI, CRE, Economist, Counselor of Real Estate, Valuation Expert. Conway is a well-respected speaker and author with a history of accurately forecasting commercial real estate trends and changing market conditions across the U.S. He is a nationally recognized Subject Matter Expert on commercial real estate matters with specialized expertise in valuation, ports and logistics, housing economics, bank regulation and real estate finance. He has held progressive roles within the Federal Reserve (CRE Risk Specialty Officer), national brokerage and large bank organizations. Among the top challenges lenders face today is the need to meet higher expectations set by the OCC and the Federal Reserve governing the use of third-party vendors. While the guidelines were released over a year ago, there is still confusion about what institutions should be doing. One thing, however, is certain. Effective vendor management takes resources, and many institutions are finding it necessary to add staff and/or technology to help with the cause, particularly smaller institutions. The regulators have made it clear, vendor management is not just a one-time assessment, but is an ongoing process, and monitoring vendors long term is as important as the initial due diligence. EDR is pleased to host a webinar on this timely topic on Wednesday, August 12, 2015 at 2:00 p.m. EST. Scott Roller, former head of vendor management at Citigroup, will provide clarity on the new regulations and help break down regulator expectations into easy-to-understand terms. Roller will explore key dimensions that attendees can use as the foundation for building out their own robust vendor management oversight program, from initial vendor risk classification all the way through ensuring adequate executive engagement in vendor management. • What does the latest regulatory guidance on vendor management require? • What are the biggest headaches banks are facing in complying with them? • What advice is recommended for smaller banks struggling with limited manpower/resources? • What are bank examiners looking for during audits? • What are the latest best practices for policies and procedures? • How are banks coping with the need to track and monitor vendors? • What are the most common shortcomings that audits reveal? Attendees will also receive a free copy of a white paper on vendor oversight and the cost of compliance. Commercial real estate markets continue their slow recovery. As demand for loans intensifies, regulatory compliance is top of mind for financial institutions. Bank regulators are exercising strict oversight over all types of bank underwriting, including commercial appraisals. This webinar will address head-on the challenges that institutions face in meeting the latest guidance impacting the appraisal function, and what risk managers can and should be doing to survive an appraisal compliance audit. • What do current guidance/regulations require of banks related to appraisals and how has that changed? • What specific things are bank examiners looking for in an appraisal compliance audit? • Are you doing everything you can to prepare your institution for the scrutiny of examiners before an audit? During an audit? After an audit? • What are the latest best practices that banks should include today in their appraisal policies to protect themselves during this stage of market recovery? EDR Insight is fortunate to have Mitch Kreeger for this timely event. Kreeger is a well-known Subject Matter Expert (SME) on various valuation, environmental and seismic risk, and regulatory compliance topics by peers nationwide. Currently, Kreeger is Chief Appraiser and Principal Consultant at Kreeger Consulting, a private appraisal/environmental/seismic risk consulting services firm that offers commercial appraisal reviews, outsourced Chief Appraiser duties, and advisory services to lenders on regulatory compliance, efficient appraisal/environmental risk functions, and effective policy updates. Join us for a look at the forces driving demand for your services so that you can better position your firm for growth in the new year. With risk management in the spotlight, environmental risk management policies are more important than ever. Environmental insurance options have evolved to offer lenders proven ways to manage risk as commercial loan originations increase in the second act of market recovery. Join us for this webinar as seasoned insiders share their insight into how insurance policies can effectively manage risk exposure. Attendees will also learn how environmental insurance can be applied to lending practices based on real world examples of claims scenarios. • Background on the latest tools available to help lenders protect collateral on real estate loans or investments. • The know-how to avoid an embarrassing loss on loan portfolios due to environmental issues. • The latest intel on how lender environmental insurance can help lenders make more loans. Regulatory pressures are fundamentally impacting the way that financial institutions manage the appraisal function. Our speakers will tackle the most impactful issues for both lenders and appraisals today. An expert from the Appraisal Institute, the largest appraisal membership society in the world with 23,000+ real estate valuation experts worldwide, will share first-hand research into the challenges faced by appraisers and by lenders that rely on the technical expertise of appraisal services. Attendees will learn about the concerns commercial real estate appraisers face, and the challenges their lender clients face in finding quality appraisers to help them respond to new policies and requirements. Speakers will also share insight into the latest policies from bank regulators like the OCC and FDIC that are impacting the integration of appraisals and environmental risk management. An expert in the trenches of a small community bank will share his insights into the shifting alignment of appraisals and environmental risk management at the community bank level, the importance of having a sound policy in place and actions that banks can take to best prepare for the scrutiny of examiners. With scrutiny on lenders’ risk management policies intensifying, more and more community banks are writing their first policies or updating old ones. The OCC just raised the bar for the banks it regulates with the August release of expanded guidelines for environmental risk management that bring their policy requirements in line with those of the FDIC. What are the critical components that should be in every policy? What elements are common to most institution’s policies? How does your institution measure up to industry best practices? How is policy administered across organizations? Join us for this webinar as seasoned insiders selected from the ranks of a mid-sized bank and small community lender share their experiences in writing and updating environmental policies. Learn what these experts are doing to protect their institutions from environmental risk exposure, and the dangers that lenders face by not having adequate policies in place to protect them from financial and legal liability. For lenders operating in the shadow of the Dodd-Frank Act, CFPB and other regulatory enforcement agencies are focusing their efforts on consumer protection, disclosure and transparency and deem these critical to all areas of an institution’s compliance and operation. A dizzying array of new rules and regulations, often disruptive to existing operations, are raining down upon the mortgage lending industry. Now, however, it’s not enough to simply be aware of emerging rules and regulations. Little known requirements and regulations which have been on the books for years without being enforced are now getting renewed attention from those agencies, likely opening up an entirely new front in the uphill battle to stay compliant. One of the greatest potential risks to lenders arises from requirements for residential property appraisals and evaluations. It is likely we will see stricter environmental underwriting and more regulatory scrutiny on lenders’ risk management policies. Discover now where lenders are most at risk, and learn about cost-effective measures that can be taken to stay out of the regulatory crosshairs. • Predict the possible financial impact upon lenders, as well as offering potential solutions for risk mitigation. Vapor intrusion, the migration of volatile chemicals from the subsurface into overlying buildings, presents potential health risks and environmental liability at properties with current or past contamination. The U.S. EPA is preparing its final Vapor Intrusion Guidance for evaluating and assessing risk from VI. The release of EPA’s guidance is scheduled for release a few months before ASTM is expected to publish a revised Phase I environmental site assessment protocol (ASTM E 1527). Among the changes to ASTM E 1527-05 is the addition of new language throughout the standard to include the assessment of vapor migration risk. EDR is extremely fortunate to offer you a webinar with three speakers who have been performing successful VI investigations for many years, and have been working with ASTM and the U.S. EPA to provide comments on draft documents. With the scheduled release of EPA’s final VI guidance—followed by a revised ASTM E 1527 standard to include vapor intrusion—now is the time to prepare and ensure that due diligence policies include VI and that appropriate science is used to minimize the impact of VI on property deals, including brownfield redevelopment. It is critical that risk managers understand what these two documents mean in terms of the standard of care and how it might affect their own liability—or that of their borrowers. What's in store for lender due diligence this year? Join this EDR Insight webinar to learn about the top ten trends that will define the world of lender environmental due diligence this year. Topics will include: how lenders' risk aversion is changing in response to market conditions, geographic hot spots for commercial real estate investment, the implication of this year's wave of loan maturities for environmental risk management, the forecast for commercial real estate lending in 2012--and more. Environmental due diligence this year will take many shapes. Banks must meet intense regulator pressure to minimize their exposure to environmental risk in their commercial real estate lending operations. Asset dispositions by lenders to clear their balance sheets of distressed loans and properties are on the rise. And on top of that, a record-high wave of loan maturities is coming in 2012. Attendees will learn how banks today are responding to the need to manage environmental risk effectively, expectations for lending levels and asset dispositions as a massive transfer of commercial properties gets underway. EDR helps real estate lenders such as banks, credit unions, capital investors and others with their property due diligence needs by simplifying their lending operations, improving risk management, and meeting ever increasing regulatory demands. Join our webcasts on Lending Risk Management topics.